Snowden wins! Well done, Scotland. Thank you, Glasgow. You are brilliant, students of Glasgow. He is an international icon and now he is your rector. Another Mandela moment. We can be different. We can stand up and be counted. We are the good guys. Will the politicians have the guts to salute the students of Glasgow? 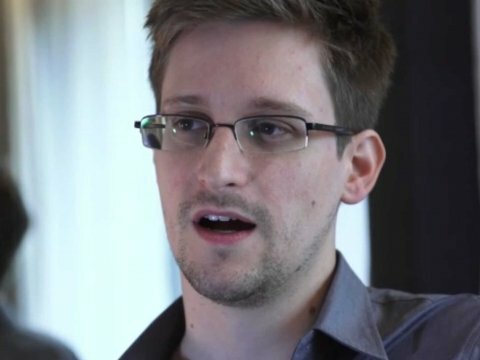 Let’s start a movement for Snowden and urge our government to offer him asylum. The SNP stood against America on Megrahi. Let’s lead again on justice and compassion for those who risk everything to tell us the truth. Liberals across the world will be applauding Scotland tonight. Wow, that is a brave and wonderful result for free speech and the democratic right of people, to decide who best reflects their hopes for an uncertain future. We just need to follow through with a Yes vote on 18 September. Erm, aren’t these the same students who voted overwhelmingly against Scottish independence last year? You’re correct, so if they want him to have political asylum it will only happen with independence. They haven’t thought this through. I think Snowden is actually fairly right wing, and supports gun ownership. He is a libertarian Republican. I support his stance against the NSA/GCHQ. It is still a good thing for Glasgow University to have him as a rector. I think he’ll have to wait until after Independence to get asylum. I can’t see the UK government upsetting their US masters any more that they have recently, They still haven’t forgiven them for voting against action in Syria. Great news! Young people have come up…..I was going to say “trumps”….. but let’s say “on top”. Nothing inherently wrong with supporting gun ownership. Look at Switzerland’s gun ownership percentages. In everything I look at, high *legal* gun ownership correllates with a low crime rate, while high *illegal* gun ownership correlates with a high crime rate. But we can worry about that sort of discussion after September. My – you must be looking at strange specs. The USA, of the top of my head has nearly TWO legal guns per citizen. No one wants their rate of gun crime. Rowan Atkinson said it best in ‘The Thin Blue Line’ ‘The application for a gun license is the best reason for refusing one as the person applying must be mad to want one.’ Something (again of the top of my head)like 80% of homicides in the States are carried out with the LEGALLY OWNED house gun. As I said in a recent comment, much as I am very disappointed with the Guardian’s handling of the Referendum Debate, I shall not forget how in June last year it helped get the Snowden story out to the world. I feel very proud that the Glasgow students have voted him to be their Rector. Maybe there’s hope for the youth yet. You might be interested in this blog – title irony? Yes the campaign for human rights.Dismissing Scotland’s right to independence.Basically a right wing critique of Alex Salmond.What are they teaching students these days! Couldn’t care less about Glasgow uni rector.These guys voted Charles Kennedy in and any eejit that’s headline news.While I agree with Snowdon I think they are not necessarily voting him in for the right reason.Its naked publicity.How can you be pro human rights and right wing the two don’t square! Read this and noticed a certain George Laird in the comment box, only one willing to put his name to anything I see. Run definitely by the “right Wing” of stupid as i prefer to call them. Daddy manage to get them into uni. “Daddy manage to get them into uni”. My father died when I was 10 years old. I was brought up in Pollok and Maryhill, not Newton Mearns or Bearsden, just in case you think I come from a wealthy background. My first job at university you will be interested to know was as a precinct orderly, that’s bin man to you. Imagine not finding out facts before making crass comments. makes up for that other Glasgow resident Wark and her pitiful interview with Glenn Greenwald on Newsnight a few months back. Luckily, Greenwald set her straight on that occasion. Good on the students showing that dissent is still alive in some. Any comments on this Derek? I see a link to that nutters site George Laird, who tries to get you to believe he is some figure in the campaign for human rights at Glasgow University. He is nothing to do with Glasgow University of Human Rights. Instead he is a fruitcake with a vengenance. He has an issue with Nicola Sturgeon and has mounted and anti SNP campaign against her by using the fraudulent title to gain attention. Please do not give this nutter Laird, the time of day. Ah thank you, I knew the name, could not put a face to it. Where would people be in this world without the Nationalist smear campaigners? You had a go at me on the Daily Telegraph and now on this blog, are you upset? Independence campaign not doing so well? Scotland’s unpopular Deputy First Minister Nicola Sturgeon not living up to expectations? Watch this it will cheer you up. As to Edward Snowden, I got it right in early January. Also, I got it right on the EU and on NATO, and on the Scottish National Police Force and Fire Service. The SNP were well behind me, got it right on currency debate, got it right on UK Supreme Court, got it right on Glasgow City Council result 2012, got it right on Cowdenbeath by-election and so on and so on. Sturgeon got that all wrong! So, if I am a “nutter” what must you think of her? Type into Google, ‘SNP vote rigging’ and then take the names and do another search this time using the names you find and add Alex Salmond and Nicola Sturgeon, tell us all if the people doing the rigging know the leaders of the Alex Salmond party within the SNP. Love him or hate him George Laird always plays a straight bat,Hen Broon is a maniac of the lowest order . George has realized that the Fat man is hiding a lot and is RIGHTLY disappointed,I would love Georges view on the effects of the Hollie Grieg Cover up on the Fat Man. Things at GU have definately improved since I was there. If I remember correctly the egregious Michael Kelly was elected rector on my watch (preceded, it must be said by the efulgent Reginal Bosenquet). Well done Glasgow students. I find it difficult to understand why other students were so incensed at the result. Elections such as this one are democratic and the students who lost out are only making a fuss because of who he is. But Snowden’s election as Rector was a democratic decision taken by the majority of the students. Snowden was very brave in exposing the NSA and GCHQ intrusion into the lives of ordinary people in the USA and the UK. No country should have the right to spy on its own citizens. It’s just unfortunate he didn’t plan his exit from the USA more surely, rather than end up in Russia, poor guy.